A 24 year-old allegedly lost control of his speeding Porsche on a motorway in Greece yesterday and crashed into a mother and her 3 year-old daughter sitting in a parked car. Four people, including two in the Porsche, were killed in the crash and subsequent explosion. The high speed crash was caught on the security feed of the service station where the mother and daughter were parked, waiting for the father who had gone inside to use the restroom. Warning: the following video and description may be disturbing. 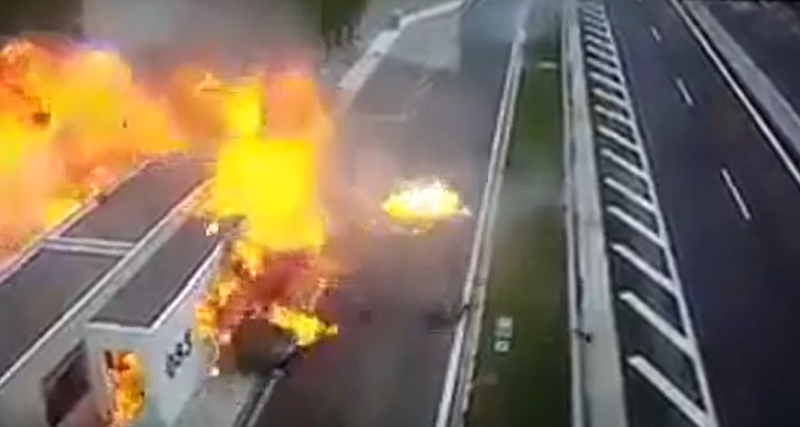 The crash is almost unbelievable, showing the Porsche come sliding off of the motorway and into the service station’s parking lot at an absurd speed, slamming directly into the parked car and almost immediately exploding into a massive fireball. A few moments later, you can see the father of the little girl killed in the parked car come running out of the building. The driver of the Porsche was reportedly 24 year-old George Vakakis, the son of a wealthy Greek businessman. The fourth victim was his passenger, who has yet to be identified. According to a translation of the article linked in the video’s description, the roads were dry and a witness claimed the Porsche passed them on the motorway at a high speed before losing traction. This is just another, horrifying example of an idiot with money pushing a powerful car beyond the driver’s capability on a public road. This time four people are dead, including a little girl, who was killed right before her father’s eyes.